Michael Renkel born 1965 studied classical guitar in Hamburg (Hamburg Konservatorium). Main emphasis of his work is an interest in open methods of composition. In constant dialectic relationship with improvisation. The way he treats the guitar defines itself between the two poles of tradition (influenced by composers like H.W. Henze, L.Berio, M. Kagel, J.Cage, M. Feldman, Violeta Dinescu … also old lute music) and the developing of an own language including the preparation of the acoustic guitar. 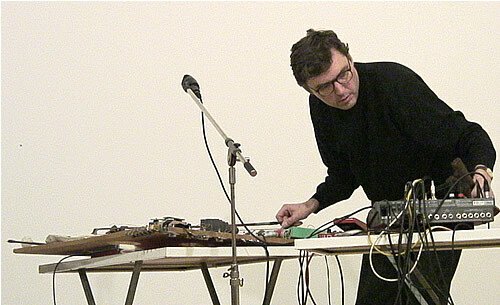 He also extends the instrument via computer technology and live electronics and collaborates with video- and fine arts. In the electric guitar work the notebook sound is produced with the ( prepared ) guitar, using the computer in realtime. An FX processor is connected to the mixer to add live effects. Latley he also uses zither in recent performances. He is one of the organizer of Berlin’s 2:13 Club a triumvirate with Athens (Nikos Veliotis) and London (John Bisset) including the record label. He was founder of 2:13 Ensemble (with Margarete Huber, Burkhard Beins, Markus Wittstein, Bettina Junge). Amongs developing their own pieces in open collective process, they have performed full graphic score Treatise (Cornelius Cardew), one of the rare full performances of this exceptional work in the world. Over the years Renkel formed various long standing groups: NUNC with percussionist Burkhard Beins, saxophonist Martin Pfleiderer and vocalist Wolfgang Ritthoff; Activity Centre a duo with percussionist Burkhard Beins, large ensemble devoted to collective improvisation Phosphor (w Annette Krebs, Andrea Neumann, Axel Dörner, Burkhard Beins, Alessandro Bosetti, Ignaz Schick and Robin Hayward). He also co- runs two other duets- first devoted to live sampling and digital tapes manipulation with argentinian electronic musician Gato Leiras- Urbano Mystica Amplitude (also collaborations with a VJ Sonja Bender) and Rebecca with clarinetist Kai Fagaschinski. His compositions have been published at Verlag Neue Musik / Berlin. He lives and works in Berlin.